It looks like Samsung has a new Android smartphone in the works, and this one will be based on the new Samsung Galaxy S2, the Samsung Galaxy S2 Mini. The guys over at Engadget, were sent an internal document from UK mobile operator Three, which shows this new Samsung Galaxy S2 Mini Android smartphone along with some specifications. It looks like the Samsung Galaxy S2 Mini will come with Android Gingerbread, and will features a 1.4GHz processor, plus a 3.7 inch WVGA touchscreen display, plus a five megapixel camera with autofocus and an LED flash, plus a front facing VGA camera for video chat. 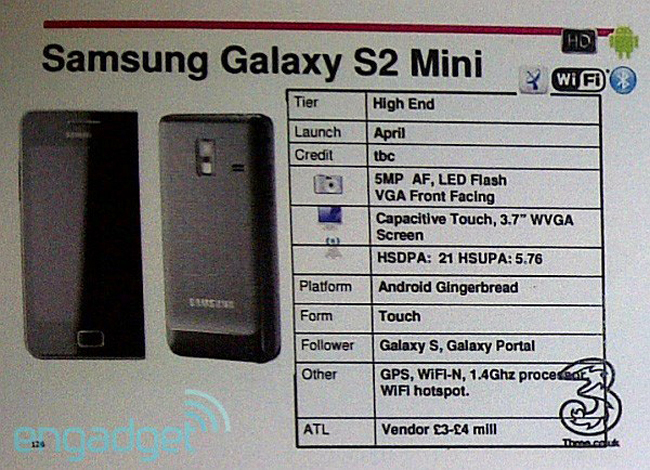 The Samsung Galaxy S2 Mini will come with WiFi and HSPA+ connectivity and it looks like it will launch in April. Have a look at our Samsung Galaxy S2 Review to see what we thought of Samsung’s latest Android smartphone.